I'd been resisting these ever since the day they first came out when I stumbled across a brand new full display of them and I almost bought every single shade. I stopped myself. Not because I thought they'd be bad (though that thought crossed my mind as well), but because... What am I going to do with cream eyeshadow? 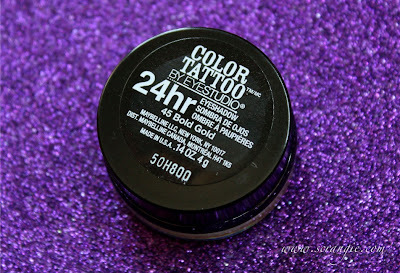 It's just one of those products that I never use, and when I do use it, it's almost always as a base for another color. That's also the reason why I haven't bought any of those Make Up For Ever Aqua Creams yet, even though I drool over the display every time I'm in Sephora. The fact that you're seeing this review makes it kinda obvious that I caved and picked up that orange one that's been calling my name since day one... And a gold one to keep it company. The color is vibrant and it plays well with powder eyeshadow. I applied it over my entire lid and blended it out softly into my crease and when I applied the MAC Pigment over it, it didn't cause any of the weird blending problems that I usually experience when using creme and powder shadows together. For this application I started with a primer. 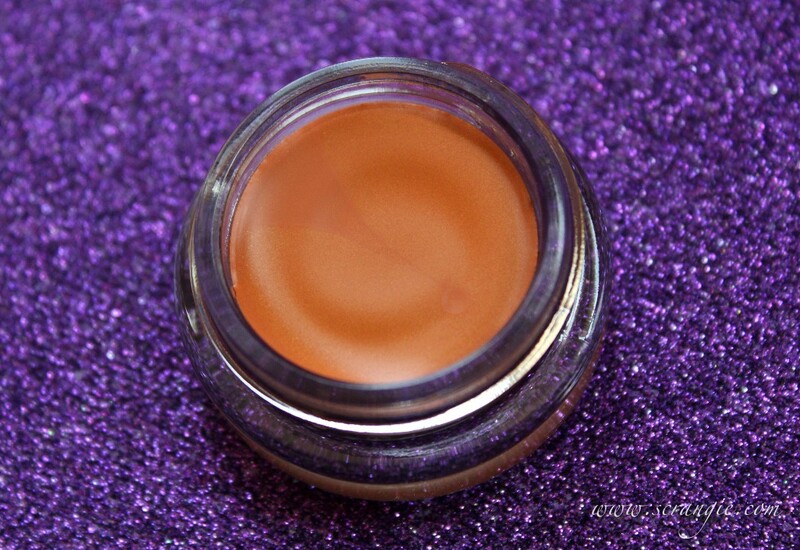 I first applied a fairly thin layer to my lids using my fingertips, not patting but spreading, gently blending the edges of the color into my crease. 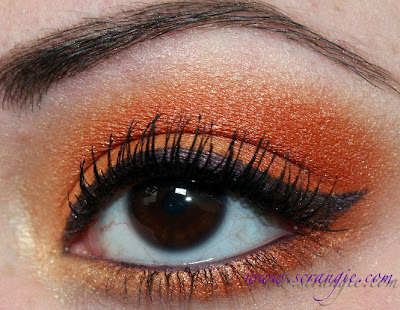 To build the color, I patted on a second layer using a fluffy eyeshadow brush. The only reason I used the brush was to see how well it worked with the cream shadow formula. It worked with this shadow, but not the gold one. 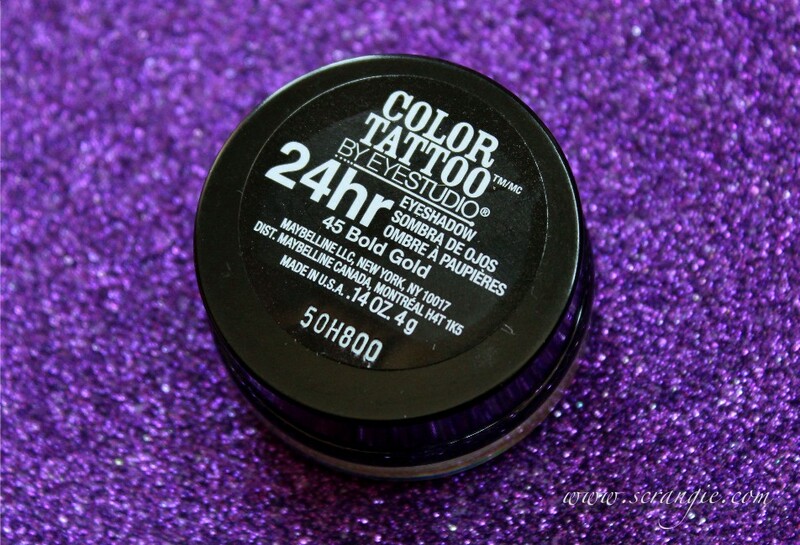 I've since worn this color a few more times and have just used fingers only for application with good results. This one was not as opaque as Fierce & Tangy. It applies as a sheer layer of gold shimmer when applied normally, but patting on more layers helped me build it to the density shown here. It has a subtle twinkly sparkle to it without having any actual glitter. Good variety of colors available (click here to view the full shade range on Maybelline's website), not just plain neutrals. Super creamy formula. It's soft and smooth, somewhat firm, not quite melty but not dry and dragging. 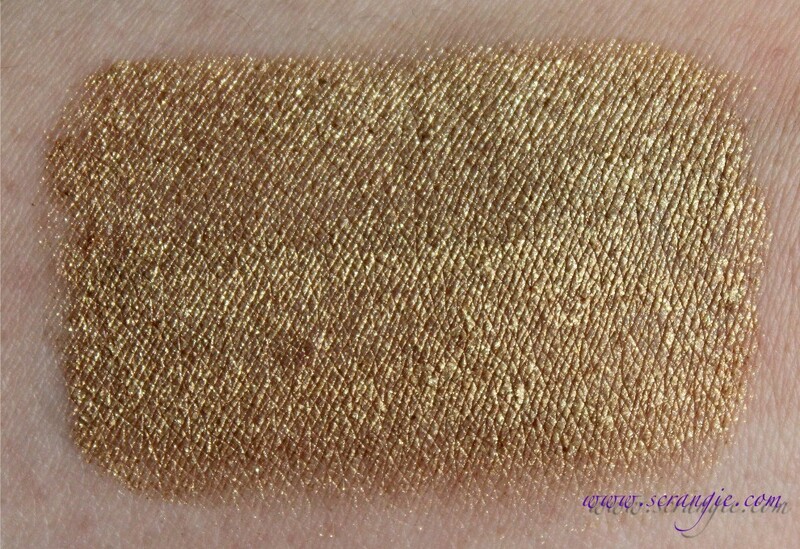 Nicest cream shadow texture I've ever felt. Makes me think of buttercream frosting. Color really does last all day without creasing. Doesn't take very long to dry. Would be especially good for people who like to wear just a color wash since it applies so quickly and lasts all day without creasing. Inexpensive. I paid slightly too much for mine at CVS (about $7), but every other store I've been to has them for around $5. Didn't irritate my eyes, dry my eyelids or flake off during the day. 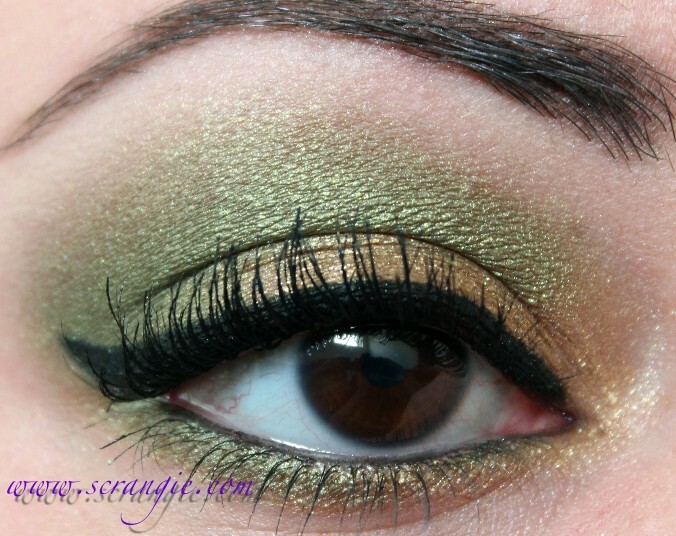 Didn't interfere too much with blending when I applied a powder shadow alongside it. Normally creme shadows grab onto the powder and don't allow it to blend seamlessly, leaving me with harsh edges and weird dark streaks. It makes my eyelids look rough, dry and wrinkly. Possibly because I apply multiple layers, but I need my shadow to be opaque, so multiple layers are a necessity. It didn't experience any creasing as I'd normally expect (a thick line of product building up in the crease of my eye with bald spots from where the shadow has migrated), but I did notice lines of visible skin along the tiny natural wrinkles and creases of my eyelid. Hard to explain in text, but it is visible in the pictures above. This is gross, I know, but I slept in my makeup to test the 24 hour claim and when I woke up, the shadow had mostly worn away. I can see it lasting the full 24 hours if you stay up the entire time... But that's the only reason I can think of for wanting 24-hour makeup. Applying multiple layers of this product can be tricky. Too much pressure and you'll remove the layer you've already applied and have to start over. Not dry enough and the product won't stick, too dry and it will look cakey/chunky. A gentle patting/rolling motion with a fingertip is what worked for me. I can't figure out how to use them as a crease color and have them look opaque and smoothly blended, so these are lid-only colors for me. Packaging is very ugly. Has nothing to do with the performance of the product, but they're really not nice to look at. I liked these more than I expected to. I have used a lot of cream shadows in the past that were either too greasy/slippery so never dried and creased massively, or too stiff and dry and were difficult and uncomfortable to apply. These are neither. 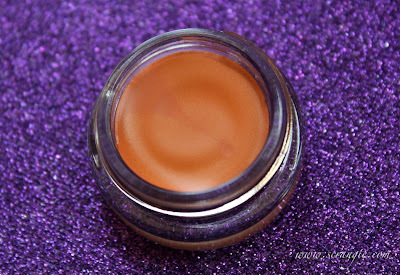 The formula feels fantastic and glides smoothly onto the lids, but then sets quickly into a dry finish, almost like a cream-to-powder formula. I really like Fierce & Tangy a lot. 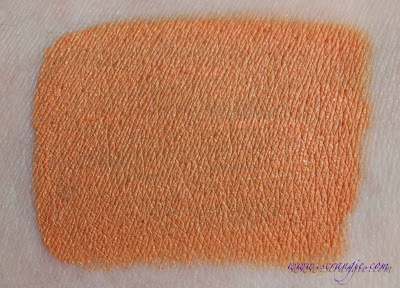 It's a perfect light orange and I love that it has a matte finish. Bold Gold, I could take it or leave it. 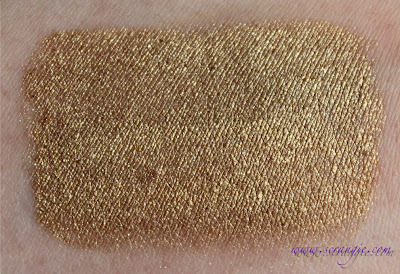 It's not bad, but I have about a million gold eyeshadows that I love and there's really nothing special about it that sets it apart from them. 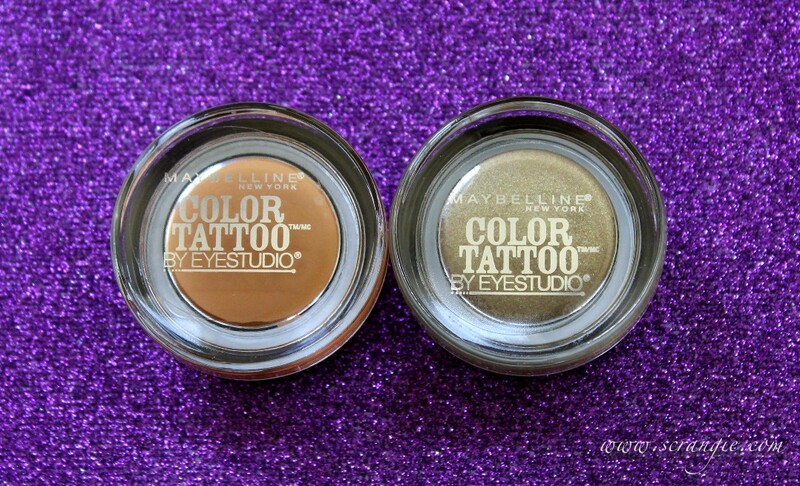 Looks amazing on you-both shades! 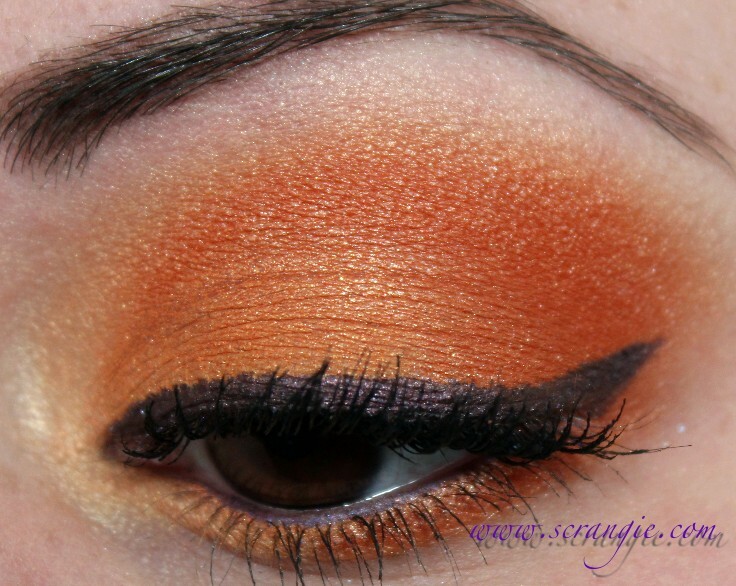 Scrangie, I know the focus of this post is the eyeshadows but whenever you show us your eyes I cant help but admire your eyebrows! They are so beautiful! Do you use anything at all to tame them, or make them look darker/thicker. I was thinking of buying an Urban Decay Brow Box, but I was wondering what you use? I used to use Urban Decay's brow box, the brown one (I think the color was called Brown Sugar?) and loved it, but I finished it a while ago and haven't bought a new one yet, so I've just been filling them in with eyeshadow. 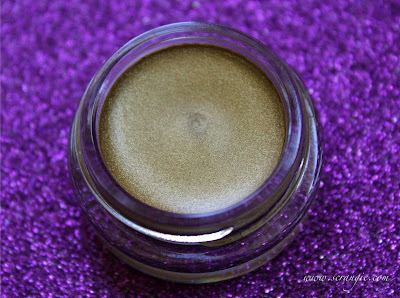 Anastasia's brow powder is really good, too, but eyeshadow works just as well. I use a really short-bristled slanted brush and just follow my natural brow. Then I use a clear brow gel to keep them in place. The brow gel is the big secret to making them look nice, I've always battled with my brows until I started using it! I'm currently using the Anastasia clear brow gel. I like it more than brow wax, it stays in place better. I've been wanting to try these product but I'm not a big fanatic of cream shadow unless is for a base.. Fierce and tangy color is beautiful.. I have Fierce & Tangy and I agree. It really blends well and helps make an orange shadow pop! Isn't it gorgeous? Really pleased with that color. 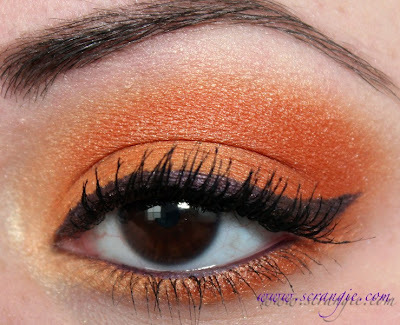 I love the orange look! Beautiful. Your second look looks like Péridot tranformed into an eyelook! Awesome! Those are intense!! I really like the green and gold. Thank you for posting this!! I've been tossing around the idea of trying these out forever, but wasn't sure if it would be worth it. The quality is definitely good, I think they're worth the price! It just depends on how much you like cream shadow, you know? The white one applied to bare lid makes a perfect primer for other shadows. 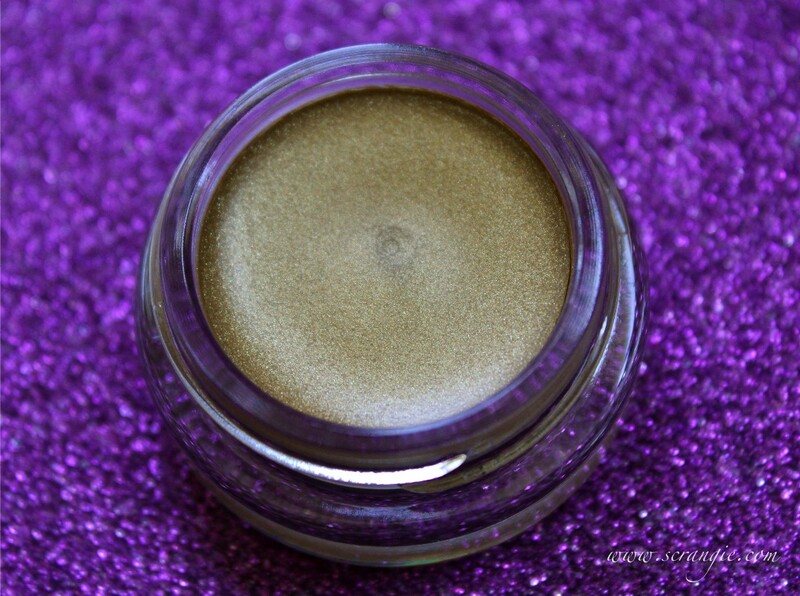 With my gold undertone purple shadows turn brown and blues turn green when I use a flesh toned primer. 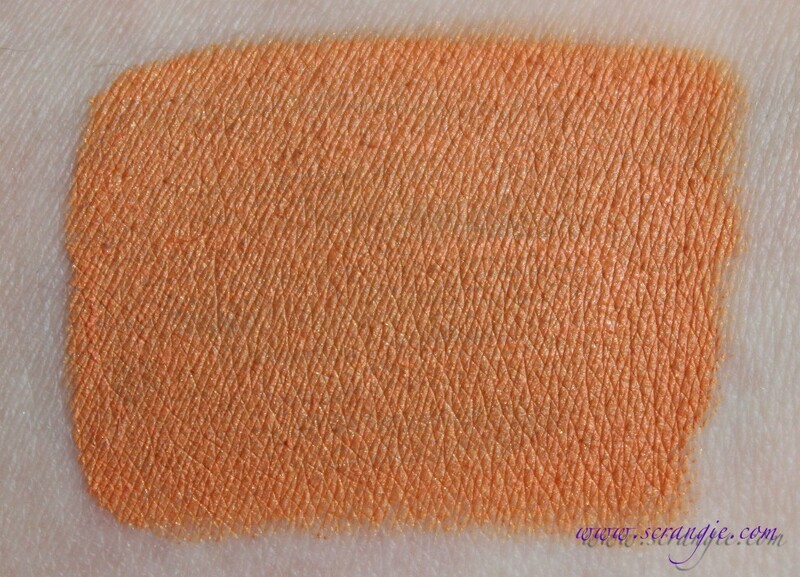 The color stays true and doesn't budge all day when I apply it over this shadow in white. I thinks it's called "too cool"
I love the taupe one (matte) and would get more but the rest are too sparkly for me. 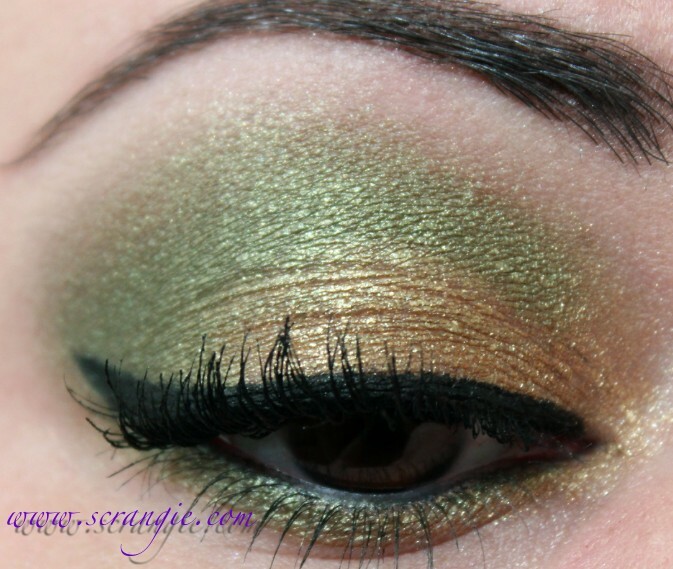 After a certain age, ultra-glittery eyeshadow looks weird! Since my skin is drier now, I love cream eyeshadow, but when I was younger and had oily skin I couldn't wear it. Thanks so much for this review. 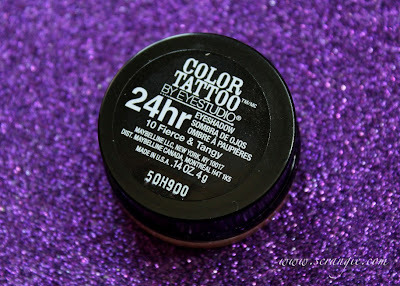 I really have been tempted like I have not been with drugstore eye products in a long time with this one. But so many wishes I had not wasted my $ has kept me from trying this. Your review stating that it makes your eyes look rough, dry and wrinkly was all I needed to know to keep me away. I can deal with all but the wrinkly as I am starting to have a problem there with even some of my fav brands. 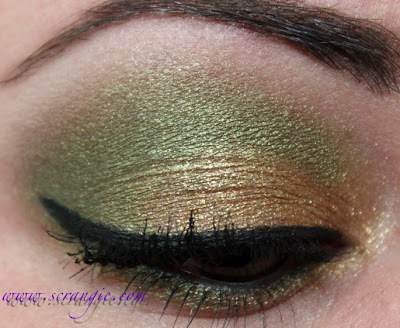 The new pressed BE shadows really do that to me and make me look like I have super old, wrinkled, hooded eye lids. In the case of BE they are too dry and also too much frost. I showed my 8 y/o daughter some of your EOTD pics and she said she wished you were her sister so you could teach her how to do makeup! I have a couple and I must say I love them! You should try Tough as Taupe it's a great crease color that matte! I bought the purple one!i love it! I was wondering if you'd review these :) Thank you! I have a random question-- what eye look did you do for your wedding? I imagine it was beautiful and spectacular!